Dr Mamatha Devi is a obstetrician,gynecologist and infertility specialist. Some of the services provided by the doctor are Normal Vaginal Delivery (NVD) and Endoscopy etc. 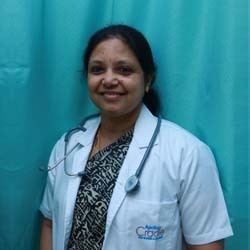 She has completed MBBS from Bangalore University in 1989 and in MD – Obstetrics, Gynaecology- RGUHS in 2012. She has experience of 18years. She started as an asst professor in KIDWAI bangalore and worked there for 10years. I highly recommend Apollo Cradle as the best place for experiencing the real joy of birthing. It is worthy and the care delivered is really amazing. All the staff members respond very quick. My special thanks to Dr. Mamathadevi.